We continue to honor Jewish history at TRT, adding to it through our own temple story. In October 1980, Joan Hollander and Marilyn Abrams put a sign up in Foodtown (the only nearby supermarket) expressing their interest in starting a new Reform congregation. At the time, Temple Shaari Emeth, the Reform temple in nearby Manalapan had closed their membership. Approximately 35-40 people showed up at the initial meeting which was held at the Central Mall in Morganville. Shortly thereafter in the summer of 1981, approximately 20 families began building a new Jewish community. They celebrated Shabbat services periodically in people’s homes, studied Jewish history and Hebrew and they also joined together for purely social events such as a summer picnic and also began celebrating Jewish holidays together with a Chanukah celebration. Rich Herzog volunteered to be the first president. The UAHC (now URJ) provided information to the group and they drafted a charter. A group of women, many of whom were teachers, – Judy Freilich, Maxine Herzog, Barbara Klein and Elsa Williams began to work in the spring on establishing a religious school with an appropriate curriculum. In September 1981, the religious school was started. The school combined grades a bit and met at The Central School on Route 79. Carol Davis and Barbara Klein were the initial administrators followed by Elsa Williams and then Edna Coleman. By 1982, the congregation met every other week at the Central School on Route 79 for Friday night services. They began using the name Rodeph Torah which means seekers of knowledge. Later in the year, the congregation began to meet at Asher Holmes Elementary School for Friday evening Shabbat services. The congregation built a Sukkah outside of the school and celebrated numerous Sisterhood activities there. High Holiday services were held at the Marlboro Middle School. By the end of 1982, the congregation had grown to 100 families. Services were led by UAHC student Amy Scheiererman. In April 1984, the temple signed a contract for its first full time Rabbi – Rabbi Donald Weber. He began leading the congregation in September 1984. The first confirmation occurred in May 1985- Jennifer Miller and Craig Zimberg. The congregation began looking for land for a temple building. There had been an exchange of land between the Township and the temple, but the deal fell through in November 1984 due to legal issues involving the land. In August 1986, the temple purchased 7 acres of land near Rte 18 and 79 in Marlboro. The congregation had grown to nearly 150 families. The congregation needed to obtain a variance due to insufficient parking spaces. In June 1987, the Marlboro Board of Adjustment approved the building plan unanimously. The land began to be cleared in the spring of 1989. At this point, the temple membership had grown to 200 families and had about 300 students in the religious school. Although the building was not yet completed by the fall of 1989, after our Rosh Hashanah morning service ended at the middle school, everyone was invited to come to our building as the shofar was blown in the middle of plywood and sawdust. 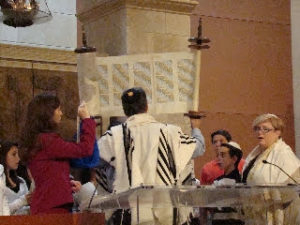 On February 23, 1990, our Torahs were ceremoniously brought into our finally finished sanctuary and the congregation helped put the mezuzah up on the front door, marking the building’s official dedication. Community leaders were invited to the more public dedication ceremony on April 29, 1990.